NHL Legend Lanny McDonald was the guest speaker for last November’s Eighth Annual Dinner at the Yellowhead Hall on the 5th of the month. The event also featured a delicious dinner and an award ceremony for the Annual Neepawa Sportsperson of the Year Award during the meal. McDonald enjoyed getting to share stories of his playing days in the NHL and showed a lot of pride in the fact that he has had such a wonderful career doing so. The former player also loves to do speaking engagements and was extremely pleased that he was invited to be the main speaker for last year’s Sports Dinner function. The former Right Winger was drafted in the 1973 NHL Amateur Draft and ended up playing with the Toronto Maple Leafs, Colorado Rockies, and Calgary Flames during his time in the league. In addition to those franchises, he also played internationally for Team Canada and participated in a couple of events as a player and even more as a manager. McDonald’s number 9 was retired from the flames team in 1990, and he also won the Bill Masterton Memorial Trophy for his great sportsmanship and dedication to the sport in 1993. McDonald recently traveled to Neepawa in Manitoba, Canada to be the guest speaker for their Eighth Annual Sports Dinner event that happened on November 5th in the Yellowhead Hall. There was a lot of great energy in the room, and McDonald was just as pleased to be there as the audience was to have him. 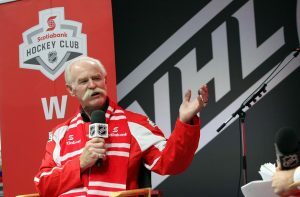 If your company is interested in finding out availability and booking fees for an NHL star like Lanny McDonald or other sports celebrities for a Guest Appearance, Keynote Speech, Speaking Engagement or Fundraiser Event, call us at 1-888-246-7141.